Head over to Coupons.com to print off three new Old Orchard coupons. Use zip code 66336 if needed and look under the “beverages” section. 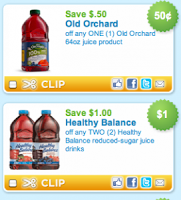 $0.50/1 Old Orchard Juice product, 64 oz.